The toughest part about fundraising for high schoolers is getting them to participate. Another coupon book or cookie dough catalog fundraiser may not motivate them enough. Here are our top five ideas for high school fundraising that students will want to be a part of. They’re a good fit for fine arts, sports teams, or even school-wide fundraisers. Host a tournament in your cafeteria or gym. Charge each player a registration fee, and ask students to bring ping pong tables. If enough of them volunteer to bring tables, the ping pong tournament would be pure profit. Pickleball, dodgeball, and carnival game tournaments are other good options. You can scale these tournaments to include the community at large. Then, sporting goods stores may want to sponsor the event. This idea can be as simple or as large as you’d like. You can even make a “casino” night out of the raffle. When students win games, they earn tickets. Local businesses may donate prize items if you let them be sponsors; the sponsor fees can help pay for your promotional materials. If they’re able to send a representative out to your school to take pictures while students win the prizes they donated, they’ll be able to show it off on social media. Local restaurants are happy to sponsor your school for a night. Your school fills up the restaurant, and they’ll donate a portion of that night’s food sales to your cause. This is an effective high school fundraising idea because it makes 100% profit. Especially in small towns, high schoolers are looking for an excuse to go out with their friends. If your high school has off-street parking for students, allow students to bid on getting the closest parking spaces, and then come up with a reasonable fee to paint a reserved parking spot for the school year. Students can come up with some really creative artwork for their parking spots; this could be a great way to raise money as a senior class project, and give the class a warm memory to take with them to college or into a vocation. 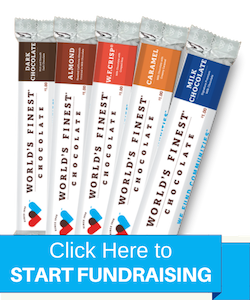 World’s Finest Chocolate has raised more than $4 billion for high schools and other organizations across the country. Not only is it profitable with up to 50% profit, but it’s one of your easiest options as a high school fundraiser. Made with a family recipe, from cocoa beans we grow in the Caribbean, right here in the U.S.A.
Up to 50% profit margins...try out our fundraiser profit calculator! Get started with your local rep today, and pick up your free fundraising guide. We look forward to hearing from you!